Washington, DC – The Arc’s employment program, The Arc@Work, is pleased to announce it has received a $325,000, one-year grant from the Walmart Foundation. This funding will be dedicated toward scaling the programs that The Arc@Work and Walmart have created over the past two years to train and place people with intellectual and developmental disabilities (I/DD) in competitive, integrated employment within their communities. Employment rates for people with disabilities – especially people with I/DD – are critically low compared to people without disabilities. The US Census Bureau’s American Communities Survey (2015) estimates that people with any disability or a cognitive disability are employed at much lower rates (34.3% and 24.8% respectively) than those without disabilities (73.6%). Additionally, the National Core Indicators Survey of 2015-2016 reported that 19% of people with I/DD in the workforce reported having a paid job in the community. In response to these dire statistics, through funding from the Walmart Foundation, The Arc@Work has built a successful partnership in working with local chapters of The Arc to provide competitive and community-based employment opportunities and strengthening chapters’ relationships with local businesses since 2016. To do this, The Arc@Work provides technical assistance and an average sub-grant award of $10,000 to chapters of The Arc located across the country that provide community-based employment opportunities. Over this two-year span, the Walmart Foundation has supported The Arc@Work and chapters of The Arc located across the country in training more than 2,000 individuals and placing more than 800 individuals into competitive and community-based jobs. Additionally, participating chapters of The Arc have forged relationships with nearly 500 local and regional employers to provide trained job candidates and staff training on creating inclusive work environments. This new round of funding will allow for The Arc@Work and chapters of The Arc to achieve even greater impact over the next year. “For far too long, people with intellectual and developmental disabilities have been relegated to the margins of the working world. Along with private initiatives, new government regulations promise to dramatically increase the number of people with disabilities placed alongside of people without disabilities in integrated, competitive environments. The support from the Walmart Foundation will allow The Arc to continue to transform the existing pool of talented candidates with disabilities into productive employees,” said Peter Berns, CEO of The Arc. Washington, DC – The Arc is pleased to announce that its national employment program, The Arc@Work, has received an additional $122,000 over the next two years from the Mitsubishi Electric America Foundation to support its ongoing efforts to expand its partner program with Specialisterne®. The Arc@Work and Specialisterne®’s program consists of a four-week intensive training curriculum and on-the-job training designed to equip people with autism with the skills and knowledge they need to succeed in entry-level IT jobs. Mitsubishi Electric America Foundation previously supported this project of The Arc with $105,000 in funding from 2015-2017. The Arc has a partnership with Specialisterne USA®, a 501(c)(3) charitable organization established by a Danish nonprofit organization, The Specialist People Foundation, that works to create meaningful employment for people with autism and similar challenges in the technology sector. The program engages top companies with IT needs interested in hiring young adults with ASD and pairs them with chapters of The Arc that provide the four-week training course, during which participants learn the basics about programming and data management while also improving soft skills. At the end of training, participants are hired into partner organizations as developers, programmers, analysts, and administrators. Employers also receive training on supporting employees with ASD and The Arc@Work and Specialisterne® work together to provide follow-up support for program participants. Chapters of The Arc in Philadelphia and New York were among the first to adopt the Specialisterne program in 2014, but the program has since been adopted by chapters in Tampa Bay and Washington, DC as well. The 2018-2019 grant from Mitsubishi Electric America Foundation will allow The Arc to expand this crucial program to new regions throughout the country. Specialisterne employment model, we hope to see increased numbers of young people with autism empowered to enter the competitive workforce and live productive lives,” continued Hora. The program emphasizes that many young adults with ASD are qualified to work in highly skilled positions and, with employer commitment and support, they can thrive in community-based jobs of their choosing. “There are many young people with ASD that possess the skills that are in high demand in the tech industry. This program plays matchmaker, and through our chapter network, we can not only connect a population we serve with employment in the community but also raise awareness in a major industry about what people with disabilities can do. It’s an exciting initiative and we are thrilled to have the Mitsubishi Electric America Foundation’s ongoing support,” said Peter Berns, CEO of The Arc. The Mitsubishi Electric America Foundation, based in the Washington, DC area, was established in 1991 by Mitsubishi Electric Corporation and the Mitsubishi Electric U.S. companies, which produce, sell and distribute a wide range of consumer, industrial, commercial and professional electronics products. The foundation has contributed more than $15 million to organizations that are empowering young people with disabilities to lead more inclusive and productive lives. A year ago, The Arc announced the exciting news that it had been awarded $245,000 by the Walmart Foundation to support workers with intellectual and developmental disabilities (I/DD) to enter the workforce. The Arc@Work, The Arc’s employment program, quickly got to work with chapters from around the country to make a dent in the unemployment rate for people with I/DD, one job placement at a time. When Danielle first began employment services, she exhibited low self-confidence. And throughout the job development process, Danielle struggled with social interactions ranging from phone calls to interviews. As she experienced her first career fair, job interview, and informal meetings with potential employers, her confidence started to grow. Eventually Danielle received a call for an interview at a local senior facility that would result in a pivotal change in her life’s course. The day before she was scheduled to interview, Danielle and her employment specialist practiced interview questions. The following day, Danielle was stellar during the interview process and performed the best she ever had! Her employment specialist knew when they walked out of the building that she would be offered the job. Danielle was able to engage the interviewer in a funny story and her demeanor and the content of her answers were on point. The following week Danielle was offered a job! Danielle has been working at the senior facility now for 10 months. Her transformation has been incredible. In late June, Danielle’s astounding professional and personal growth was recognized at an awards ceremony sponsored by The Arc of Monroe County. Based on this year’s achievement, The Arc was awarded an additional round of funding this past spring. With this support, The Arc hopes to build upon the success it began in 2016. At the end of 2016, The Arc@Work launched a nationwide partnership with Baymont Inn & Suites. Through this initiative, The Arc@Work is helping individual hotels fill the brand-new Hometown Host position. The Hometown Host ensures guests feel at home and that there is plenty of delicious food throughout the daily breakfast service. The role is a symbol of the brand’s emphasis on neighborly service and dedication to community. The collaboration is a win-win for both organizations: helping individuals with intellectual and developmental disabilities (I/DD) secure a regular job in the community while assisting Baymont hotel owners in finding reliable, passionate employees who can connect with their guests and provide them with a great experience. In honor of National Disability Employment Awareness Month, The Arc@Work interviewed Billy Jake, the first individual placed through this new initiative at his local Baymont Inn & Suites hotel in Celebration, Florida. Because of his interest in food, this young man initially applied to a local grocery store. Unfortunately, this endeavor did not turn out as he had hoped. Then one day Billy Jake’s job coach, Tre Johnson, informed him of The Arc@Work’s partnership with Baymont Inn & Suites. Thus, began a year of hard work and patience that ultimately landed Billy Jake the Hometown Host position. Billy Jake now looks forward to waking up every morning and getting ready for work. His days are quite busy, arranging the daily breakfast buffet, ensuring diners’ desires and needs are met promptly, interacting with the hotel guests and colleagues, and, once the breakfast service is over, preparing for the next morning’s service. Then comes his favorite part: munching on goodies made by his colleague Kathy in the hotel kitchen! Over the last six months, Baymont Inn & Suites has taken steps to make sure the Baymont franchises and the larger community is aware of their interest in hiring people with I/DD. They, like The Arc@Work, understand the positive contributions individuals with I/DD like Billy Jake make, not just in the workforce, but in society as well. Washington, DC – One in 68 children today are being diagnosed with autism spectrum disorders (ASDs). The unemployment rate of adults with intellectual and developmental disabilities (I/DD), including ASDs, is 85 percent. This appalling statistic coupled with the increase in prevalence of kids being diagnosed demands action from all sectors of our economy to ensure that people with ASDs are finding appropriate employment at a fair wage, and retaining that job with the proper supports to be successful and have a career of their choosing, just like people without disabilities. With nearly 65 years of experience working with and serving people with I/DD, including autism, The Arc is launching an exciting new resource called TalentScout for employers to unlock the talents of people with autism in the workplace. 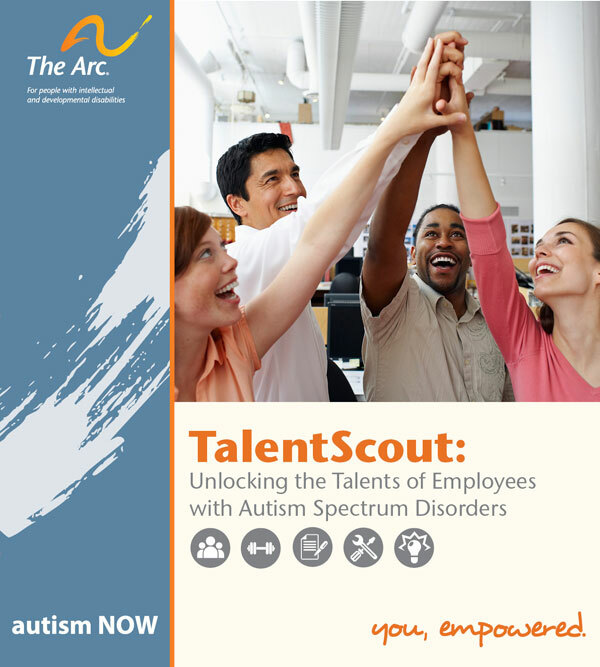 TalentScout is a first of its kind resource toolkit that gives employers essential insight and tools that harnesses their employees with autism fullest potential and leads to higher levels of productivity in the workplace. “People with autism have a lot to contribute in all aspects of our society. In the workplace, their individual unique talents need to be maximized to benefit both the goals of their employer, and their personal desire to have and keep a job that adds meaning to their life. Far too many people with autism are left on the sidelines of our workforce, and entities that have recognized the benefits of hiring someone with autism are reaping the rewards. Whether it’s the loyalty that someone with a disability may bring to their employer, or their unique skill set that gets the job done, people with autism are ready for hire,” said Peter Berns, CEO of The Arc. TalentScout is a valuable resource for government agencies that are working to implement President Obama’s initiative (EO 13548) to hire 100,000 people with disabilities into the federal government workforce, and for federal government contractors who need to bring their companies in compliance with the new 503 regulations on employment of people with disabilities. These new regulations require federal contractors to conduct targeted outreach to the disability community, establish a 7% workforce utilization goal; implement data collection mechanisms to measure effectiveness of affirmative action, provide invitation to applicants and existing employees to voluntarily self-identify, and to perform an annual evaluation to measure outcomes. The Arc is providing a unique resource for employers in that TalentScout’s content has been vetted by people with autism, and it includes their first-hand accounts and insights as job applicants and employees. It is backed by the years of nationwide experience of The Arc’s vast chapter network, and by Autism Now: National Autism Resource and Information Center. “TalentScout is an extremely valuable guide. This sets the bar high for employers,” Jose Velasco, SAP, Head, Autism at Work Program. “The personal stories and insights took this document to another level,” Kristie King, Comcast/NBC Universal, Manager, Diversity Recruitment. TalentScout is one component of TheArc@Work, which is leading the way in developing innovative workforce solutions for the government and private sector by connecting employers with talented employees with I/DD and supporting the recruitment, on-boarding, and retention process.